Room, not to be confused with the Tommy Wiseau epically bad disaster “The Room“, is a solid drama with powerful moments from it’s two lead actors. The opening shots are close up images of items in that appear to be from a child’s point of view. This will be very important because this film is told entirely from a child’s point of view. The child in this film is five year old Jack, played by Jacob Tremblay, and early on we are dropped into the setting and story. At first we do not know or understand why he is living in this single “room” with only his mother. Jack seems like he is some type of special education child, or just a brat, or both, but soon the story begins to unfold as more information is given to Jack and the audience learns how and why he is in here. This method of revealing the plot is powerful by the end but while it is happening the director does a very good job creating a claustrophobic atmosphere, and seeing everything unfold from the child’s perspective is very frustrating at times. Some parts are very uncomfortable to watch, but fortunately it all pays off and proves to be a rewarding experience. The main reason to recommend Room is for the performances. Brie Larson as the young mother and Jacob Tremblay as her son have some genuinely powerful moments on screen. They have already garnered a number of big acting awards, and they deserve all of them. Also, the reliable character actors Joan Allen and William H. Macy have small parts and they enhance the lead performances, as they do in every movie they appear in. This movie works because of the actors, not because of the director who has very few long takes, most of the shots in Room last a little over a second and this can be jarring on the viewer with a lot of jumpy movements and quick cuts. But this can be forgiven since it is from the child’s vantage point. That being said there are moments of inspired direction especially during a scene involving young Jack on the back of a pick-up truck and in a police car, great use of framing with shots inside of a house where they make the staircase walls really look like a prison with bars going across our characters faces, and the closing shot of the film is a beautiful farewell. Room really works best going into it knowing very little about the plot so that way it can unfold slowly and you feel the frustration that our characters feel living inside of the room. The movie emerges by the end as more than just a good sociological experiment. 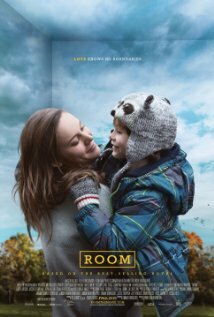 Room is a portrait of mental illness, a carefully constructed study of child abuse and above all else, a powerful film that is worthy of the attention and praise it has received. The video below has absolutely nothing to do with the film reviewed above other than it’s title, but come on, I could not resist to lighten the mood with some Tommy Wiseau.